One of my favorite foods used to be mixing yogurt and flavored protein powder in a bowl, post dinner! It felt so guilt free that we needed to make a Low Carb Yogurt to relive the protein yogurt days, minus all the carbs. The toughest part about this recipe is waiting to enjoy it as the probiotics work their magic. Although time intensive, it is far from labor intensive, and honestly one of my favorite recipes to date so go ahead and make it! Matt and I definitely follow the if it fits your macros philosophy so your keto diet food list could contain way more foods than the next person who may do total carbs or stay very strict. However, this low carb yogurt recipe is one for everyone, even those who are dairy intolerant. We use canned coconut milk or cream to create this dairy free yogurt and it's basically zero carb! Add it to all the lists you have, keto and non-keto because homemade anything always tastes best! The Simplest Of Low Carb Sweets! The best part about this recipe, in my opinion, is that once you make one batch using either a probiotic pill or yogurt starter you can make 4-5 more batches by using the first low carb yogurt you make. This allows you to have a high fat, low carb dessert recipe in the fridge at all times. You can simply add some vanilla or maple extract, spices of your choosing or protein or cocoa powder to create a simple and delicious low carb dessert! 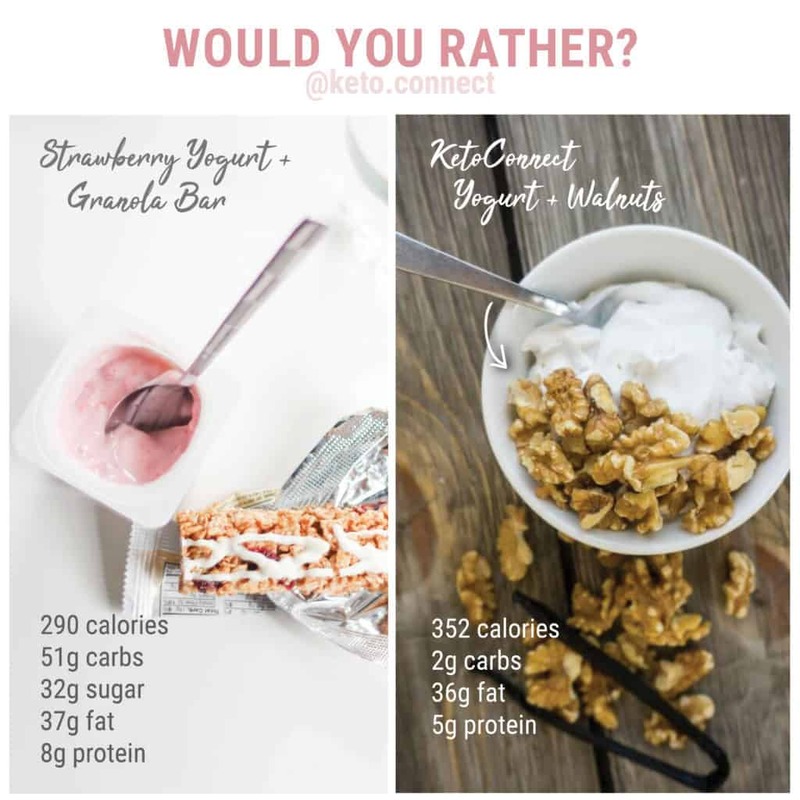 If yogurt isn't your thing you can give our no bake cheesecakes or keto brownies a try! If you're a fan of yogurt and are missing out on it since starting your new keto lifestyle then I highly recommend you watch video above of Matt making it so you too can bring yogurt back into your life! It's great for breakfast, lunch, dinner, as a side dish and dessert - you really can't go wrong by having some in your fridge. When making low carb yogurt requires no more than two or three ingredients, what is stopping you?! 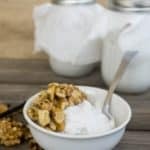 Recipe can be quickly added to MyFitnessPal - Search "KetoConnect - Low Carb Yogurt"
Allow your coconut cream to sit in the fridge for 24 hours prior to using. This will harden the cream so that you can easily separate it from the water. Scoop out all of the coconut cream fat (2/3 of the can) and add it to a clean, sealable mason jar or any jar on hand. Heat the yogurt in the microwave (105 degrees) and use a heat thermometer to check the temperature of the coconut cream. Add probiotic pill (open capsule and pour contents into the cream) or yogurt starter and add it to the cream and stir/shake it. Cover the top with some cheese cloth and place a rubber band around the cheese cloth to keep it in place. Place the yogurt in a dry place (microwave, oven, corner of the counter top) and let it ferment from 24-48 hours. Once the 24-48 hours have passed seal the container and place it in the fridge - this will stop the fermentation process. Note: Consume within one week! Enjoy! Note: When making the second batch you can use 2-3 tbsp from the first low carb yogurt made to start a new batch. No pill or starter is needed!